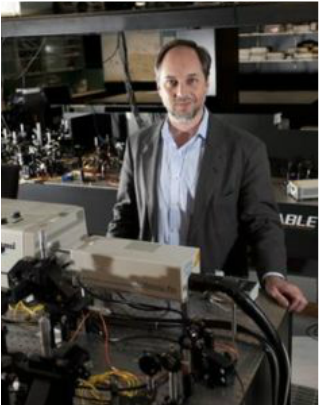 Director of Griffith University's Centre for Quantum Dynamics. However, the "Many Interacting Worlds" approach developed at Griffith University provides a new and daring perspective on this baffling field. "The idea of parallel universes in quantum mechanics has been around since 1957," says Professor Wiseman. "In the well-known "Many Worlds Interpretation", each universe branches into a bunch of new universes every time a quantum measurement is made. All possibilities are therefore realised - in some universes the dinosaur-killing asteroid missed Earth. In others, Australia was colonised by the Portuguese. But critics question the reality of these other universes, since they do not influence our universe at all. On this score, our "Many Interacting Worlds" approach is completely different, as its name implies." Dr Hall says the "Many Interacting Worlds" theory may even create the extraordinary possibility of testing for the existence of other worlds. "The beauty of our approach is that if there is just one world our theory reduces to Newtonian mechanics, while if there is a gigantic number of worlds it reproduces quantum mechanics," he says. "In between it predicts something new that is neither Newton's theory nor quantum theory. We also believe that, in providing a new mental picture of quantum effects, it will be useful in planning experiments to test and exploit quantum phenomena."